This weeks photo challenge is labelled ‘Enveloped’. I love to visit London, but being quite short I do feel like Stuart Little, when walking in between a mass array of high-rise concrete structures and sky scrapers. This image shot in London shows how one can be completely covered and surrounded by structures in a claustrophobic way which is why I chose it as my entry. The photograph was taken a few weeks back during a late night walk around London where I spent most of my time taking architecture shots, which is one of my favourite subjects. This sky scraper is called Tower 42. Built in 1980, it was the tallest building in the UK for 10 years and occupies Natwest bank employees. 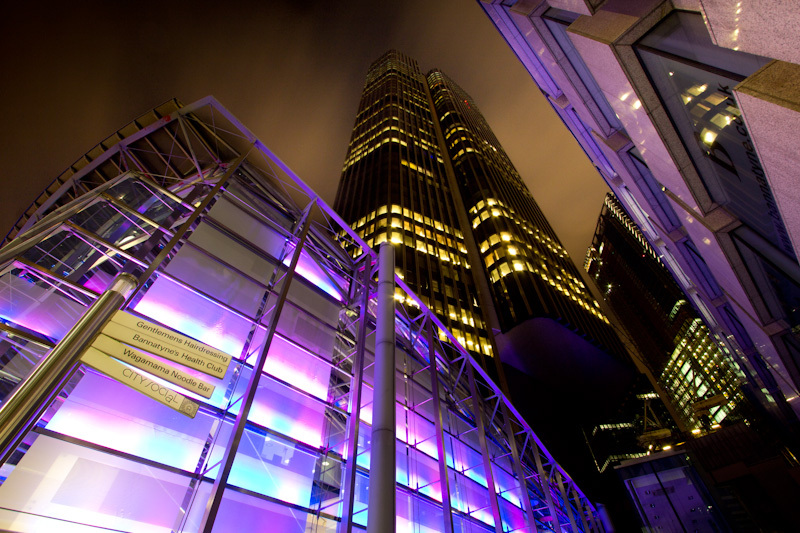 Posted in Blog, Recent WorkTagged architecture, architecture photography, building, central london, directions, landscape, london, night, photography, sky scraper, structure, tower 42, WPCBookmark the permalink.